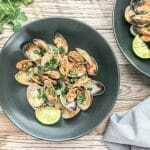 Learn the simple process on ‘How to Steam Clams’. From the cleaning process to the steaming process, this easy to follow step-by-step tutorial is all you need to create perfectly tender steamed clams. 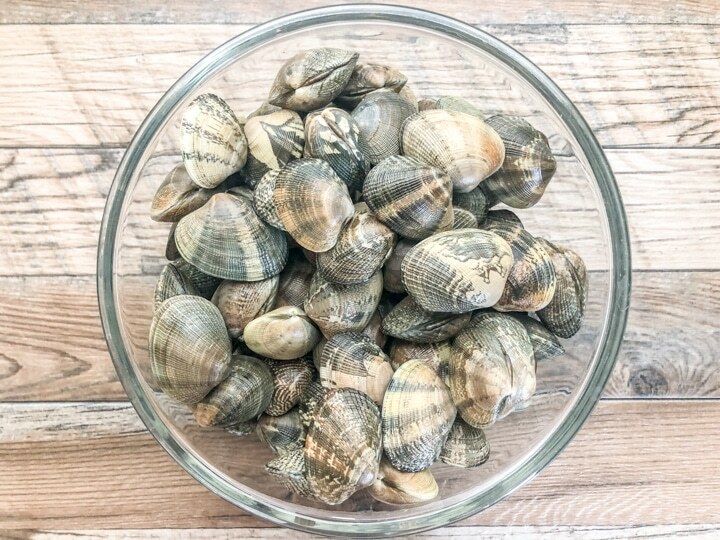 Before you begin steaming clams, you must first go through the process of thoroughly cleaning your clams. Although there are many videos on how to clean clams; I’ll walk you through a simple process for getting perfectly clean clams. Prepping live clams before steaming them can seem like a daunting task, but I’m here to tell you that it doesn’t have to be. Once you learn this simple process, you’ll bless your family and friends with clam recipes more often. Cleaning clams is the most important step before steaming them. This requires patience but is very simple to do. Here, I’ll provide an overview; however, please refer to the recipe card below for more details. If you find that some clams are slightly opened, tap on the clam to see if it closes immediately (if the clam doesn’t close discard it). This is an indication that it is dead. Place clams into a large bowl (alternatively, clean out your sink and place them in your sink). I like to use my sink. Cover the clams with water and add a few tablespoons of salt (the salt is intended to mimic salt water). Using your hand, give the water a big swirl. After thoroughly cleaning your clams, now it’s time to steam them. This is the fun part and requires literally a few minutes and minimal ingredients. It’s worth noting that you can steam your clams in white wine or water either form of liquid will work. In this recipe, I will use water to keep the recipe Whole30. 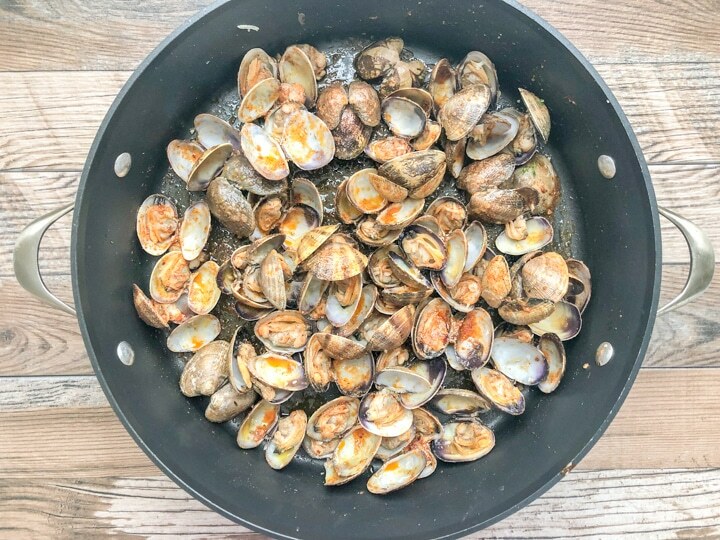 This easy 6 step process on how to steam clams with the most flavorful Cajun marinade is that simple and makes for the most tender and delicious clams. After you’ve steamed your clams, drizzle the Cajun marinade over all the steamed clams and give a big stir making sure all the clams are coated. 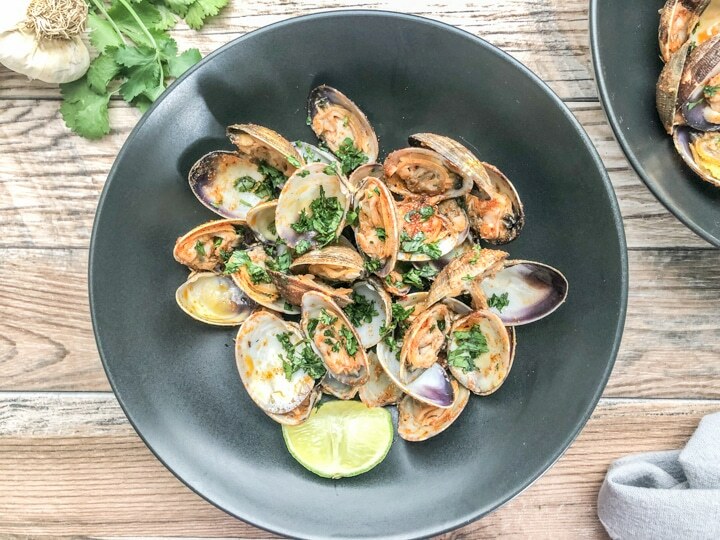 You can top off your steamed clams with a splash of fresh lime juice for brightness and chopped cilantro for freshness. Let’s connect on Instagram and Pinterest. 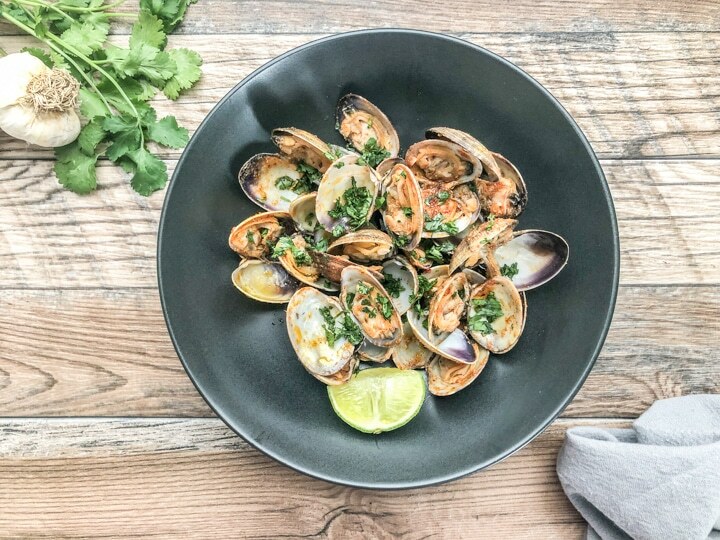 Learn the simple process on 'How to Steam Clams'. 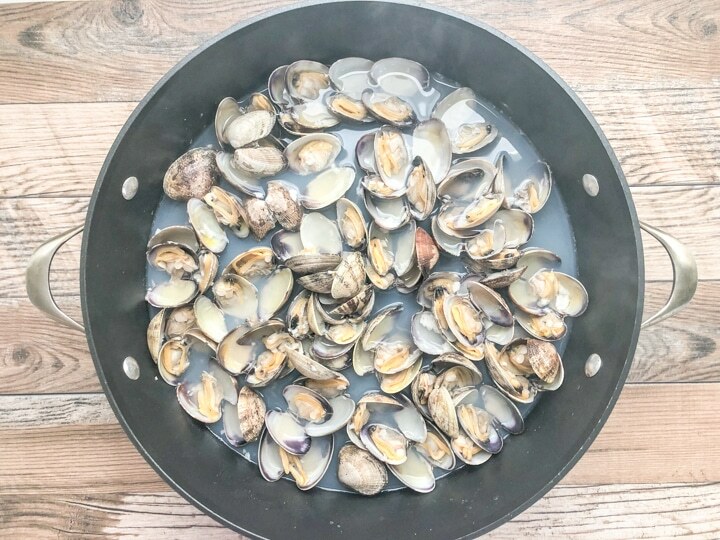 From the cleaning process to the steaming process, this easy to follow step-by-step tutorial is all you need to create the perfectly tender steamed clams. Check that all clams are closed. If clams aren't closed, gently tap to see if they close. If they do not close, discard. In large bowl or clean kitchen sink, fill with water. Add salt and give a swirl. Gently place clams in water for 20 minutes. After 20 minutes, remove clams with hands and place in an empty clean bowl. Pour dirty water out of 1st bowl or if using sink, drain water from sink and replace with clean water and salt. Place clams back in bowl or sink with fresh water and salt. Using a clean scrub brush (ONE THAT'S TOTALLY FREE OF ANY CHEMICALS), brush the outer surface of each clam THEN REPEAT STEP 2. 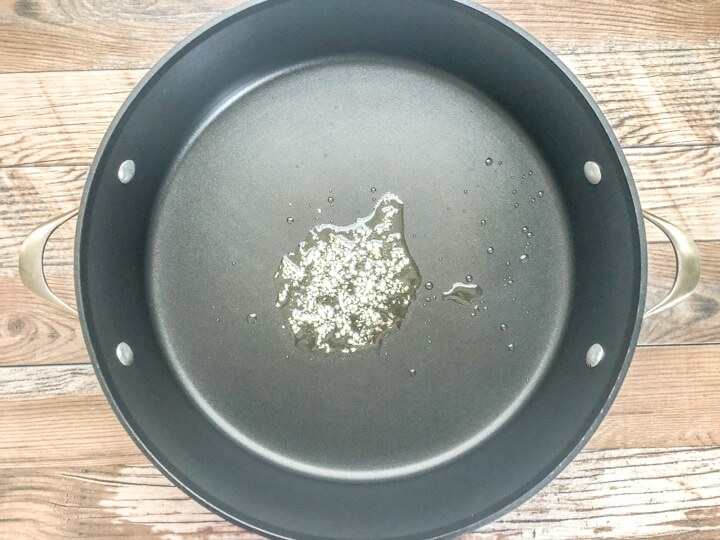 Over medium high heat add grapeseed oil to sauce pan. Add garlic and saute until fragrant. Add water/wine to cover bottom of sauce pan. Add clams in a single layer. Cover sauce pan with lid and steam for 3 to 5 minutes until clams open. Remove from heat and discard any unopened clams. Add Cajun marinade to clams, add fresh lime juice and give a stir until all clams are coated. When adding clams to sauce pan, make sure clams are in a single layer. DO NOT ADD CLAMS ON TOP OF EACH OTHER AS THIS MAY PREVENT CLAMS ON THE BOTTOM FROM OPENING. DO NO OVERCOOK CLAMS AS THIS WILL CAUSE THEM TO BECOME RUBBERY.